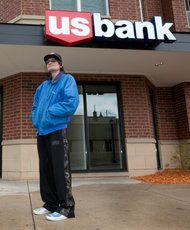 David Wegner at his U.S. Bank branch, where he has a checking account and short-term loan. A new Redstone Federal Credit Union store is designed to look exactly like a check casher. “I may as well have gone to a payday lender,” said Mr. Wegner, a 36-year-old nursing assistant in Minneapolis, who ended up choosing a local branch of U.S. Bank and avoided the payday lenders, pawnshops and check cashers lining his neighborhood. Along with a checking account, he selected a $1,000 short-term loan to help pay for his cystic fibrosis medications. The loan cost him $100 in fees, and that will escalate if it goes unpaid. An increasing number of the nation’s large banks — U.S. Bank, Regions Financial and Wells Fargo among them — are aggressively courting low-income customers like Mr. Wegner with alternative products that can carry high fees. They are rapidly expanding these offerings partly because the products were largely untouched by recent financial regulations, and also to recoup the billions in lost income from recent limits on debit and credit card fees. Banks say that they are offering a valuable service for customers who might not otherwise have access to traditional banking and that they can offer these products at competitive prices. The Consumer Financial Protection Bureau, a new federal agency, said it was examining whether banks ran afoul of consumer protection laws in the marketing of these products. In the push for these customers, banks often have an advantage over payday loan companies and other storefront lenders because, even though banks are regulated, they typically are not subject to interest rate limits on payday loans and other alternative products. Some federal regulators and consumer advocates are concerned that banks may also be steering people at the lowest end of the economic ladder into relatively expensive products when lower-cost options exist at the banks or elsewhere. Analysts in the banking industry say that lending to low-income customers, especially those with tarnished credit, is tricky and that banks sometimes have to charge higher rates to offset their risk. Still, in an April survey of prepaid cards, Consumers Union found that some banks’ prepaid cards come with lower fees than nonbank competitors. While banks have offered short-term loans and some check-cashing services in the past, they are introducing new products and expanding some existing ones. Last month, Wells Fargo introduced a reloadable prepaid card, while Regions Financial in Birmingham, Ala., unveiled its “Now Banking” suite of products that includes bill pay, check cashing, money transfers and a prepaid card. The Regions package is meant to attract the “growing pay-as-you-go consumer,” said John Owen, the bank’s senior executive vice president for consumer services. The packages are the latest twist on “cross-selling,” in which lenders compete to win a larger share of customer business with deals on checking, savings accounts and mortgages. Reaching the so-called unbanked or underbanked population — people who use few, if any, bank services — could be lucrative, industry consultants said. Kimberly Gartner, vice president for advisory services at the Center for Financial Services Innovation, said that such borrowers were a $45 billion untapped market. The Federal Deposit Insurance Corporation estimates that about nine million households in the country do not have a traditional bank account, while 21 million, or 18 percent, of Americans are underbanked. Mr. Wegner, the U.S. Bank customer, said that once he mentioned that he needed a bank account, an employee started selling him prepaid cards, check cashing and short-term loan options. Mr. Wegner, who makes about $1,200 a month, said that he felt like a second-tier customer. “It was clear that I was not getting the same pitches that wealthy clients would,” he said. Since that initial visit, Mr. Wegner said he avoided the branch so he was not approached with offers. “I go through the drive-through now,” he said. Bank payday loans, which are offered as advances on direct-deposit paychecks, are a particularly vexing part of the new pitch from lenders, consumer advocates said. The short-term, high-fee loans, like the one Mr. Wegner received, are offered by a handful of banks, including Wells Fargo. 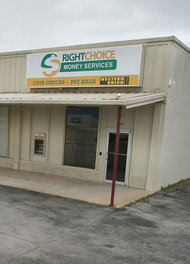 In May, Regions introduced its “Ready Advance” loan after determining that some of its customers were heading to storefront payday lenders. The loans can get expensive. When the loan comes due, the bank automatically withdraws from the customer’s checking account the amount of the loan and the origination fee — typically $10 for every $100 borrowed — regardless of whether there is enough money in the account. That can lead to overdraft and other fees that translate into an annual interest rate of more than 300 percent, according to the Center for Responsible Lending. The Office of the Comptroller of the Currency, which oversees the nation’s largest banks, said in June that the loans raised “operational and credit risks and supervisory concerns.” Last summer, federal bank regulators ordered MetaBank, which is based in Iowa, to return $4.8 million to customers who took out high-interest loans. Lenders are also joining the prepaid card market. In 2009, consumers held about $29 billion in prepaid cards, according to the Mercator Advisory Group, a payments industry research group. By the end of 2013, the market is expected to reach $90 billion. A big lure for banks is that prepaid cards are not restricted by Dodd-Frank financial regulation law. That exemption means that banks are able to charge high fees when a consumer swipes a prepaid card. The companies distributing the cards have drawn criticism for not clearly disclosing fees that can include a charge to activate the card, load money on it and even to call customer service. Customers with a “convenient cash” prepaid card from U.S. Bank, for example, pay a $3 fee to enroll, a $3 monthly maintenance fee, $3 to visit a bank teller and $15 dollars to replace a lost card. Capital One charges prepaid card users $1.95 for using an A.T.M. more than once a month, while Wells Fargo charges $1 to speak to a customer service agent more than twice a month. Some smaller banks even offer prepaid cards with credit lines, which carry steep interest charges. “This is a two-tiered, separate and unequal system and it is worsening,” said Sarah Ludwig, a lawyer who started the Neighborhood Economic Development Advocacy Project. Some lenders are even styling their offices to look like check-cashing stores. In June, Redstone Federal Credit Union, the largest credit union in Alabama, will open two stores that are designed to look exactly like check cashers. Copyright 2012 The New York Times Company. Reprinted from The New York Times, National, of Thursday, April 26, 2012.